The image above of the Venus southern hemisphere illustrates the terminator – the transitional region between the dayside (left) and nightside of the planet (right). The south pole is near the terminator, just above the center of the image. The complex atmosphere that surrounds the planet is also clearly visible. Venus Express has spied a surprisingly cold region high in the planet's atmosphere that may be frigid enough for carbon dioxide to freeze out as ice or snow. Venus is well known for its thick, carbon dioxide atmosphere and oven-hot surface, and as a result is often portrayed as Earth's inhospitable evil twin. But in a new analysis based on five years of observations using ESA's Venus Express, scientists have uncovered a very chilly layer at temperatures of around –175ºC in the atmosphere 125 km above the planet's surface. The discovery was made by watching as light from the Sun filtered through the atmosphere to reveal the concentration of carbon dioxide gas molecules at various altitudes along the terminator. The temperature profile along the terminator for altitudes of 70–160 km above the surface of Venus. The values were derived from the volume density of carbon dioxide molecules measured during solar occultation experiments by Venus Express’ SOIR instrument. "Since the temperature at some heights dips below the freezing temperature of carbon dioxide, we suspect that carbon dioxide ice might form there," says Arnaud Mahieux of the Belgian Institute for Space Aeronomy and lead author of the paper reporting the results in the Journal of Geophysical Research. Clouds of small carbon dioxide ice or snow particles should be very reflective, perhaps leading to brighter than normal sunlight layers in the atmosphere. "However, although Venus Express indeed occasionally observes very bright regions in the Venusian atmosphere that could be explained by ice, they could also be caused by other atmospheric disturbances, so we need to be cautious," says Dr Mahieux. The study also found that the cold layer at the terminator is sandwiched between two comparatively warmer layers. "The temperature profiles on the hot dayside and cool night side at altitudes above 120 km are extremely different, so at the terminator we are in a regime of transition with effects coming from both sides. "The night side may be playing a greater role at one given altitude and the dayside might be playing a larger role at other altitudes." Similar temperature profiles along the terminator have been derived from other Venus Express datasets, including measurements taken during the transit of Venus earlier this year. Models are able to predict the observed profiles, but further confirmation will be provided by examining the role played by other atmospheric species, such as carbon monoxide, nitrogen and oxygen, which are more dominant than carbon dioxide at high altitudes. "The finding is very new and we still need to think about and understand what the implications will be," says Håkan Svedhem, ESA's Venus Express project scientist. "But it is special, as we do not see a similar temperature profile along the terminator in the atmospheres of Earth or Mars, which have different chemical compositions and temperature conditions." 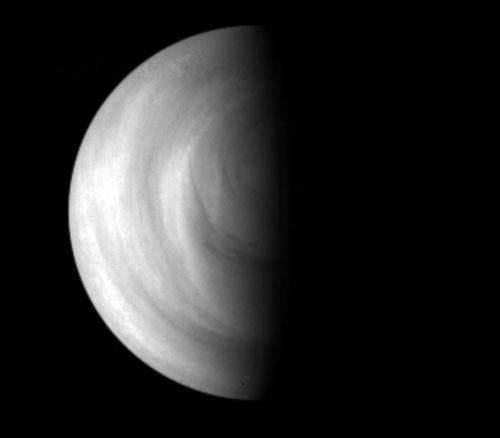 The image above was taken at ultraviolet wavelengths by the Venus Monitoring Camera (VMC) on ESA’s Venus Express spacecraft on 15 May 2006, when the spacecraft was flying at about 66 500 km distance from the planet.